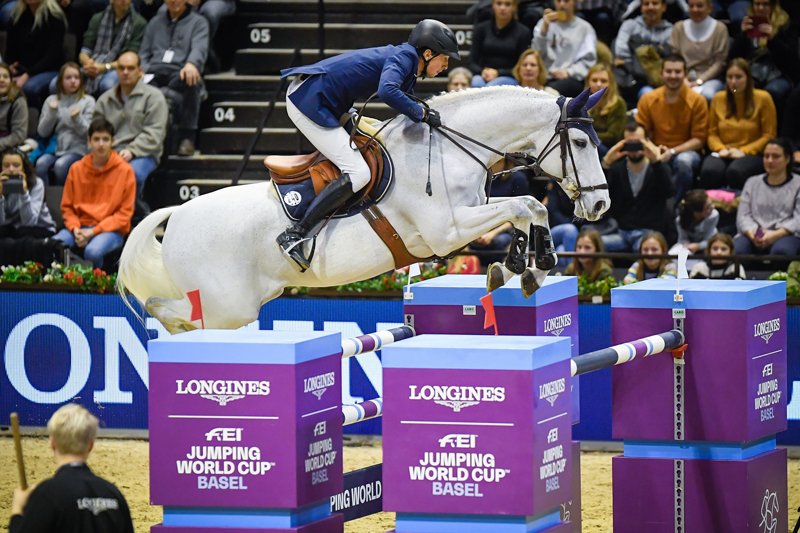 Swiss spectators were treated to a superb moment of top sport when homegrown hero, Martin Fuchs (26), stormed to victory at tenth leg of the Longines FEI Jumping World Cup™ 2018/2019 Western European League at Basel (SUI). This was the tenth anniversary of the fixture staged in the medieval Swiss town, but the first time for the venue at St Jakobshalle to host a leg of the Jumping World Cup series. And the young man who scooped individual silver at last year’s FEI World Equestrian Games™ made it all the more memorable when steering his faithful grey gelding Clooney to a last-to-go win in a nail-biting three-horse jump-off against the clock. “It’s amazing! So many people came here today, lots of my friends and my family, so to win at home in front of them is always so special – this was a great day for me and my amazing horse Clooney,” said Fuchs. The opening course designed by Germany’s Frank Rothenberger was no walk-in-the-park, with testing turns, difficult stride distances and a tight time-allowed of 68 seconds ensuring that only those horse-and-rider partnerships that were completely in sync would leave all the timber intact. A total of 21 had given it their best before Houtzager put the first clear on the board and, as so often happens, that was followed by another from Devos who was next to go. Two horses later Fuchs would add his name to the very short list of successful contenders to make the cut into the second-round race against the clock. Houtzager was first to take on the jump-off track and set the target with a great clear in 38.84 seconds, but Devos upped the pace considerably when next to go with his Stuttgart winner, Apart. However the influential double at fence 11 was still in place and when the pair lost impulsion after a tight turn on the approach the first element fell for four faults in the very quick time of 36.98 seconds. It was some pressure, but they didn’t disappoint, the gallant 13-year-old grey responding with all the willingness in the world as his rider asked him to lengthen his stride between the two oxers at the midway stage, putting in a supreme effort to clear the tricky double three from home and then turning super-tight to the penultimate red vertical. Fuchs kept his eye on the finishing line as they cleared the final fence, and when he turned to check the time he threw his hat in the air in celebration as 37.61 seconds left him the clear winner. The crowd went wild. “He was a bit fresh and spooky in the first round and the short time-allowed didn’t make it any easier – I was just inside time which was a bit lucky!” he said afterwards. But he did have a plan. “I saw the riders going before me and I discussed what to do with Steve (Guerdat) and my dad (Thomas Fuchs)” said the man who also topped the fourth leg of the Western European series in Lyon (FRA) in November. This evening, Basel’s entry to the Western European League circuit got the thumbs up from FEI Jumping Director John Roche. “The event has been organised to the highest standard, there was a completely full house today and the atmosphere was electric. A home win went to the last man into the arena, so you couldn’t have written a better script for a fantastic day of sport!” he said.